Game designer and philosopher Ian Bogost shows how we can overcome our daily anxiety; transforming the boring, ordinary world around us into one of endless, playful possibilities. The direct but oftentimes ­repetitive, idea-driven prose of Play Anything might remind you of the applied-­philosophy tactics of an Alain de Botton, even as Bogost makes no grand claim that games can make you a better person. Indeed, Bogost tries to disabuse us of what he perceives as the false gods of fun ... demonstrate[s] the importance of thoughtful, serious criticism on gaming and play. This is one of those books that overuses the first-person plural, constantly claiming that 'we' fear this or that, or that 'we' have this or that wrong-headed idea, or that 'we are also miserable and bored.' Play Anything is nonetheless an erudite and often amusing book, not so much an extended argument as a series of variations on a theme, with a wide range of reference ... Less successful are the book’s aspirations to being a self-help manual ... Where the book functions best as a critique of modern culture is in its insistence that we moderns are too self-obsessed and inward-looking. ...there is something deeply dangerous about this aspect of Bogost’s argument. Because, while a temporary magic circle may enrich our experience of going to Wal-Mart or traversing the mall, those aren’t just transitory experiences — they’re manifestations of entire systems. And Bogost’s call to take joy in those systems often seems like a call to simply accept our entrapment in them ... Bogost is essentially arguing that our problem is not the world as it exists, but our perception of it, that the mundane horrors of our time could be turned into joys if we simply appreciated them more deeply. 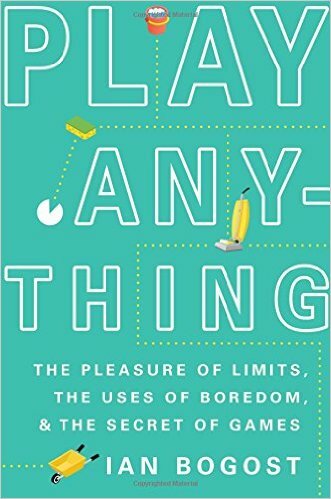 What did you think of Play Anything: The Pleasure of Limits, the Uses of Boredom, and the Secret of Games?